April 4 – 20 (various dates): Law for Nonprofits presents various workshops in Creston, Slocan Valley, Nelson, and Vancouver. Wednesday, April 4 (9:30 am – 12:00 pm) The New Societies Act: What You Need to Know – the Alliance for Arts + Culture, Vancouver. The fee is $50. City of Vancouver Bursaries available. Get more information and register online here. Wednesday, April 4 (1:30 – 4:00 pm) Privacy 101 – the Alliance for Arts + Culture, Vancouver. The fee is $50. City of Vancouver Bursaries available. Get more information and register online here. Thursday, April 12 (2:00 – 4:00 pm) The New Societies Act: What You Need to Know – College of the Rockies – Creston campus. Free if your organization is registered with the West Kootenay Transition Hub. Get more information and register online here. Saturday, April 14 (10:00 am – 12:00 pm) The New Societies Act: What You Need to Know – CVFD Fire Hall, Crescent Valley. Free if your organization is registered with the West Kootenay Transition Hub. Get more information and register online here. Friday, April 20 (2:00 – 4:00 pm) The New Societies Act: What You Need to Know – Selkirk College, Nelson. Free if your organization is registered with the West Kootenay Transition Hub. Get more information and register online here. Wednesday, April 4 (10:00 am – 12:00 pm) Registered Disability Savings Plan (RDSP) – teleseminar by phone/computer. Cost: free. Register online here. Thursday, April 5 (7:00 – 9:00 pm) OR Thursday, April 19 (10:00 am – 12:00 pm) Wills, Trusts and Estate Planning Workshop – Plan Institute Office, Suite 260 – 3665 Kingsway, Vancouver. Cost: $65.00 per person or $90.00 for two. Register online here. Tuesday, April 10 (10:00 am – 12:00 pm) Registered Disability Savings Plan (RDSP) – Plan Institute Office, Suite 260 – 3665 Kingsway, Vancouver. Cost: free. Register online here. April 5 – 25 (various dates): Courthouse Libraries BC hosts free webinars on various topics. Thursday, April 5 (1:00 – 2:30 pm) Canada Pension Plan Disability Application and Reconsideration – for legal advocates, presented by Disability Alliance BC. Register online here. Thursday, April 12 (10:00 – 11:00 am) Financial 1st Aid for Service Providers – for legal advocates and intermediaries, presented by Credit Counselling Society. Register online here. Wednesday, April 25 (12:00 – 1:30 pm) Working with Indigenous Clients: Understanding the Historic and Current Contexts that Affect Your Work – for lawyers and legal advocates, presented by Lynda Gray, author of First Nations 101. Register online here. April 8 – 21 (various dates): the Canadian Bar Association, BC Branch presents various events as part of BC Law Week 2018 by phone and across the province. April 14 – 21 Regional Events in BC courthouses – Nanaimo, Kamloops, Victoria, Kelowna. Saturday, April 21 (10:00 am – 2:00 pm) Dial-A-Lawyer Day event by phone. Everyone in BC is invited to speak with a lawyer for FREE for up to 15 minutes about the following areas of law: business, employment, family, immigration, tort & motor vehicle, wills & estates. Download the poster (PDF) for more information. April 9 – 23 (various dates): People’s Law School presents numerous free classes for the public on the legal issues of everyday living in Richmond, North Vancouver, Surrey, Port Moody, Burnaby, Cranbrook, Vancouver, Ladysmith, and Mill Bay. For a list of all classes, locations, and contact info, visit BC Law Week 2018 website. Topics include strata law, employment law, wills & estates, personal planning, accidents & injuries, and mediation. Get more information on each class here. 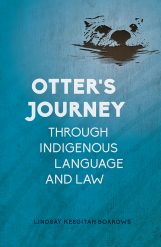 Friday, April 13 (1:00 – 2:30 pm): Peter A. Allard School of Law presents Indigenous Legal Studies Book Talk: Otter’s Journey at the University of British Columbia, Vancouver. Join the Indigenous Legal Studies for their inaugural book talk series. In Otter’s Journey, Lindsay Borrows employs the Anishinabee tradition of storytelling to explore how Indigenous language revitalization can inform the emerging field of Indigenous legal revitalization. Get more information here (PDF). April 19 – 24 (various dates): Seniors First BC presents two events in North Vancouver and Coquitlam. Thursday, April 19 (10:00 am – 2:00 pm) RCMP Fraud Awareness Day – Pipe Shop, 115 Victory Square Way, North Vancouver.